I love superheroes, and those sunnies are cool too. I just had to read this book; when I saw it on Kobo.com the want drove me crazy. It drove me so crazy that when I discovered my local library didn’t have a copy but one of its sister libraries did, I drove half an hour to pick it up. Like I said, crazy. What, you may ask, drove me so crazy? Well, I would answer, I have this thing for superheroes… Plus it had a really cool cover (so I’m shallow; sue me). You can see the original art (which is even cooler) here. 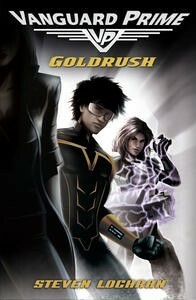 Some sort of cross between The Incredibles and X-men , Goldrush is a classic superhero story where a reluctant hero (Sam) must embrace his special powers in order to save the world. I liked Sam’s reasons for not wanting to use his powers/be a superhero, although, until they were explained in full, those reasons were a little wishy washy. I particularly liked how Lochran made these reasons feel real (when he did explain them fully) by putting names and faces to the people who were injured when Sam first used his power. Another aspect I liked was Lochran’s introduction of public relations and the media into the whole superhero thing. In Goldrush superheroes have teams of marketing experts testing the public reaction to everything from their superhero names to the colour of their uniforms. It’s a pleasant, funny and very real twist on superheroes. My biggest criticism of the book is Sam’s sudden reversal attitude in the final chapters. Within the space of a few pages he went from reluctant hero with a few serious issues, to handing out advice to other heroes on what it means to be a hero. Although I can see the message Lochran was trying to convey, it came too fast after Sam’s own decision to embrace his superhero status, which made it hard to believe. Overall, Goldrush is an entertaining, quick read, good for younger and older bookworms alike. I’m looking forward to the sequel, Wildcard . Thanks so much for taking the time to read Vanguard Prime: Goldrush and to offer such a great review! I’m really glad you liked the book, though sorry to read there were aspects that didn’t work for you. Hopefully that’ll be different for the next entry in the series (which, you’re right, is called Wild Card). And if you thought the cover for the first book was good, wait until you see what the team at Penguin has in store for Wild Card‘s publication in March!